It is a widespread belief that more births occur during the full moon than at other phases. Is that true? We have studied this issue. No correlation of births with lunar phase has been found between lunar phase and birth rates, as shown in the above plot (see the Poster link at left for a larger version of this plot.). 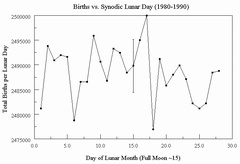 Here are shown the residuals from the mean number of births for each day of the lunar cycle. Day 1 is the new moon and full moon occurs about day 14.75. See the January 2002 DC Meeting poster link at left for components of a poster presented at the AAS with the final results.